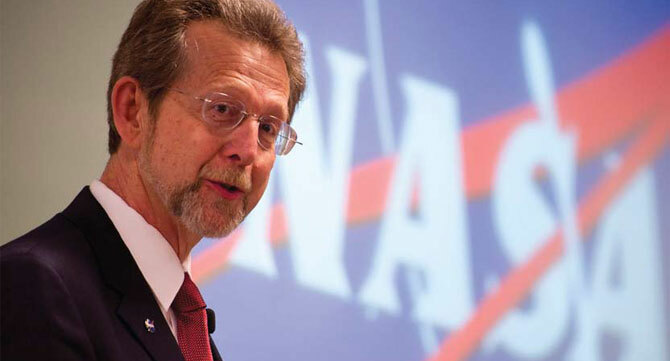 With America's space program at a critical juncture, a UI alumnus oversees NASA efforts to boldly go where no one has gone before. With little fanfare, the space shuttle Atlantis slips back home for the last time. In the early hour darkness of July 21, 2011, only a select group of invited guests witness the giant white craft glide to a smooth landing at Kennedy Space Center, ghostly vapor trails streaming in its wake. As a new day dawns, an era in the United States' space program quietly comes to a close. Just 13 days before, throngs of excited people had gathered under the blazing Florida sun, their faces tipped eagerly to the vivid blue skies and their eyes squinted to glimpse the shuttle's final historic journey to the International Space Station. Yet, Atlantis returned to a changed world. After deciding to retire the aging shuttle fleet, and thus effectively suspending the era of human space exploration, President Barack Obama set a new direction in America's space program. Abandoning previous plans to return astronauts to the moon, he urged rocket scientists and the general public to gaze farther into the cosmos. He stated, "I have tasked the men and women of NASA with an ambitious new mission: to break new boundaries in space exploration, ultimately sending Americans to Mars. Until a manned mission to Mars takes place (probably in the mid-2030s), NASA will focus on robotic missions to uncover more details about the Red Planet and other mysteries of the solar system. In the meantime, it has to keep the public, the scientific community, and the legislature informed and inspired about its work-a difficult task given the current economic climate, general lack of understanding about space science, and sharp divisions on the best way to proceed with space exploration. Thankfully, NASA has James L. Green, 73BA, 76MA, 79PhD. As director of NASA's Planetary Science Division, Green is a man on a mission: to advocate for and promote the program that seeks to "advance scientific knowledge of the origin and history of the solar system, the potential for life elsewhere, and the hazards and resources present as humans explore space." Green explains NASA's significance to the nation in terms both inspirational and practical. "NASA is about our future," he says. "Our horizons should not just be about our house, our job, or our school. There have been five mass extinctions on this Earth. We're part of a larger [solar] system, and we need to be aware of that for our survival and the survival of this planet. "The money put into NASA is not just jobs, although I fund about 1,000 planetary scientists annually; it's technology, spinoff companies, medical advances. NASA's an investment in our country-and our future." Although he agrees that the shuttle landing was the end of an era, Green is energized about what comes next. "This is the era of planetary science," he says. "When humans leave Earth's orbit, they're going to need planetary scientists and the knowledge we have gained and the discoveries we have yet to uncover." The dozens of space missions over the past few decades have doubtless reaped scientific bounties. In addition to unraveling the big questions, like how life emerged and whether we're alone in the universe, they pave the way for further human exploration and potential colonization of other worlds. Interplanetary travel isn't as simple as Star Trek makes it seem; before astronauts can boldly go anywhere, they need a solid foundation of knowledge. Green cautions, "If we send humans to [another planet], we need to know everything [possible], so that we can return them safely." Technical breakthroughs in space engineering and science often lead to practical applications right here on earth, such as robotic devices used in surgeries, artificial heart pumps, telecommunications satellites, food safety protocol, extreme weather forecasting, and even multispectral imaging technology that has revealed lost writings in ancient Roman manuscripts. Yet, in many respects, the public and politicians are less interested in space than ever before. Partly, it's because robotic probes, orbiters, and rovers don't kindle the human imagination in the same way as manned missions. To a casual observer, the U.S space program has shifted from a breathtaking, emotional saga of discovery, triumph, and tragedy to a series of interminable science experiments. And that science-with its subatomic particles, gamma waves, and advanced math-is too complicated for the average American to fully grasp. Also, at a time when other urgent national and international priorities pile up-economic crises, poverty, health care, natural disasters, and climate change-many people think the government should focus on problems right here on Earth. That's why Green tells stories of the Planetary Science Division's accomplishments and significance at every possible opportunity, including legislative briefings, via columns he writes for NASA's website, and at many public events. Affable and animated, Green channels both Mr. Rogers and Bill Nye the Science Guy. Despite the crazy schedule and heavy responsibilities that come with overseeing a $1.5 billion budget and some 40 staff including space scientists and engineers-let alone an entire galaxy full of planets, asteroids, comets, and stars-he responds to e-mails in a prompt and cordial Iowan fashion, signing off simply as "Jim." But, when he explains the intricacies and implications of planetary science, his inner geek rockets to the surface. His arms flail about as if he's conducting a symphony of information; a pointed finger hovers, awaiting the perfect moment to punctuate the most thrilling discoveries. In two educational presentations he made for TED.com, Green keeps the audience enthralled with enthusiastic talks about comets and other wonders of the solar system. His passion is genuine and unmistakable. "This is a beautiful moon!" he declares, followed shortly by descriptions of "a fabulously wonderful iceball of a moon" and "the small, blue, beautiful, beautiful Earth." The Planetary Science Division sends a balance of small, medium, and large missions to explore every corner of our solar system. It can take months or even years for instruments to reach their destinations, analyze data, and then send information back to Earth. "Planetary science is not for people needing immediate gratification," says Green, "and it's not for the faint of heart." Indeed, even after all these years of exploration, space still has the capacity to surprise experts and overturn accepted wisdom. While scientists dispatch missions with set goals and parameters, they don't know exactly what they'll unearth lurking in the red Martian soil, beneath Jupiter's cloak of clouds, or in a comet's death throes. Recent surprises include the facts that the moon has deposits of water ice at its poles, Titan is pelted with methane rain, and Venus may harbor active volcanoes. Despite some obvious differences, Mars has turned out to be very similar to Earth, such as in terms of topographical features, seasonal cycles, rotational period, and presence of water. It's the only other planet in the solar system that humans could potentially visit or inhabit-but what would they find there? Over the last few years, the Mars Rovers have discovered intriguing variations of methane emissions, which raise the game-changing possibility of some kind of microbial life on the planet. "Right now, life is an Earth-centered concept-in other words, it's only found on the Earth," explains Green. Historically, changes in an Earth-centered perspective have produced dramatic cultural, religious, and scientific upheavals. Until Copernicus developed the theory of a sun-centered solar system in the 16th century, established belief held that the Earth lay at the center of the universe and everything else revolved around it. "When Copernicus' theory was proven correct, it caused a revolution in thinking that had a major effect on its time," says Green. "One might even say it created the process of science that we know today." This artist's concept shows the Mars Science Laboratory Curiosity rover, which should arrive on the Red Planet in 2012. Like its three predecessors, the rover will examine Mars for clues to past and present life. Don Gurnett*, James A. Van Allen/Roy J. Carver Professor of Physics at the UI, agrees that the space program has transformed human knowledge-and in an incredibly short period of time. Before the 1957 launch of America's first satellite, Explorer 1, planets were tantalizing, enigmatic lights in the night sky; even the most powerful terrestrial telescopes could barely discern particular features. Yet, by 1989, when Voyager 1 and 2 completed the reconnaissance of Earth's eight celestial neighbors, scientists were inundated with information: atmospheric readings, maps of gravity fields, and thousands of highly detailed images of ice caps, volcanoes, and valleys. "Landing on the moon was a huge milestone in human history," says Gurnett, 62BSEE, 63MS, 65PhD. "But, the discoveries that robotic spacecraft have made dwarf anything that came out of the human space program. Of course, robotic instruments don't think for themselves. Humans operate them and send instructions from Earth." While various missions revealed that humans are the only advanced life form in this solar system, they also set the stage for giant leaps in exploration. "Twenty years ago, we didn't even know that other stars had planets in orbit around them," he adds. "Now, we know there are hundreds of them, and it seems likely that some will have life. Even after contributing to countless missions, both Green and Gurnett still experience a thrill with every space launch. When Juno set off for Jupiter two months ago, the spacecraft carried a UI-designed-andbuilt radio and plasma wave instrument to examine the planet's magnetosphere and auroras. Earlier this summer, the Cassini spacecraft helped Gurnett and his UI colleagues track a giant thunderstorm in Saturn's northern hemisphere. Thousands of miles in diameter, covering an area eight times the surface area of Earth, and with lightning discharges 10,000 times as powerful as flashes on Earth, the storm is much larger than previous ones. Scientists witnessing this rare phenomenon are on the edge of their seats. Unfortunately, not everyone agrees that such fascinating facts are worth the astronomical costs, especially as even a modest space mission can swallow up millions of dollars. On Facebook, 215 people belong to the "Get rid of NASA: use those billions of tax dollars on something important" group, although they are far outnumbered by the 22,122 Facebook users on the "Save NASA!" group that calls for reinstating the Constellation Program for human space exploration. In August, Time magazine published an article, "Ground Control to Major Joel," in which columnist Joel Stein pummeled the validity of NASA and compared the most recent shuttle missions to billion-dollar, glorified Fed-Ex deliveries. That's one of the reasons Green, a 31-year NASA veteran, is perfect for his current job. "Jim understands that we must raise awareness, build excitement, and make connections about what we're doing," says Kristen Erickson, Planetary Science's director of strategic communications. "He knows how to explain very complex issues in ways that people can understand. It's hard not to get excited about what we're doing when Jim is explaining it." Green credits much of his passion for discovery to his days at the University of Iowa, with its enviable reputation for making stellar contributions to space physics research. America's initial foray into space, via Explorer 1, included a cosmic ray experiment designed by legendary UI physicist James Van Allen [36MS, 39PhD, deceased]. That experiment led to the first scientific discovery of the space age: the radiation belts around the Earth that were later named in Van Allen's honor. Since then, the UI has provided instruments for so many NASA space missions that Don Gurnett believes no other university in the country, or even the world, can match Iowa's record. As an undergraduate, Green studied with both Van Allen and Gurnett. Van Allen got him hooked on space research and convinced him to switch from groundbased to space-based astronomy, while Gurnett was his master's thesis advisor and also employed him as a research assistant. Gurnett calls Green "one of our star students," commending him for the scientific expertise and accomplishments that led to his current position with NASA. As Gurnett's assistant, Green wrote and set up computer analysis programs that read data from active space missions, including Voyager 1. Still operating after more than 30 years in space, that space probe is now the farthest manmade object from Earth. After sailing through the systems of Jupiter and Saturn, Voyager 1 turned and, from a distance of 3.6 billion miles, took the famous "Pale Blue Dot" photograph that reveals Earth as a tiny speck against the velvety vastness of space. Soon, the veteran probe will become the first instrument to head out of our solar system and venture into interstellar space. Out among the cold, glittering spread of stars, Voyager 1 stays the course, trying to unlock the secrets of the universe. Here on Earth, Jim Green is doing the same.